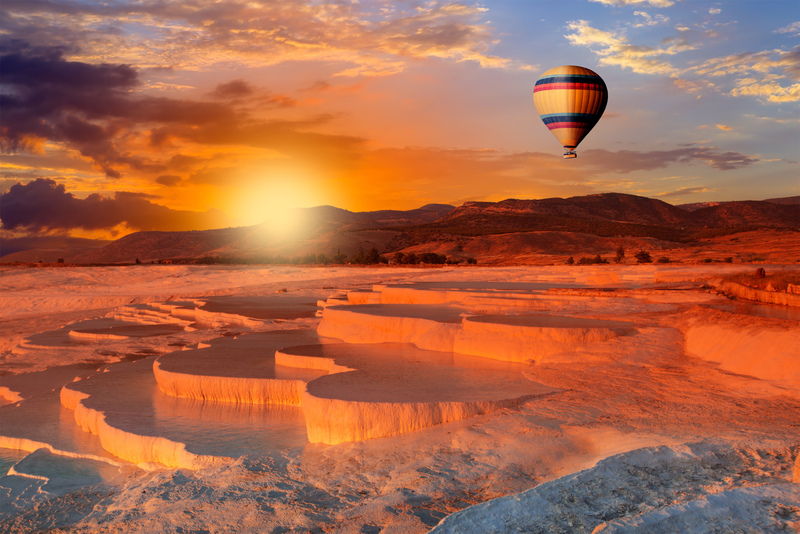 Pamukkale, is a unique, magical wonder of the nature with its dazzling white and stoned castles. The thermal waters with limestone and salt, pouring by the bank of the plateau form up these marvelous stalacites, waterfalls and pools. These healing warm waters have been used for therapy since the Roman time. Visitors are allowed to walk in the cascading pools, that leads to squashing and dispersing the soft jelly of calcium carbonate. Hierapolis, is on the same plateau with the thermal pools. provides visitors with a glimpse of the natural gifts of the region and cultural riches that man added to nature. The ancient city, situated 20 kilometres North of Denizli, is justly famous for the buildings and artefacts unearthed during extensive excavations. Hierapolis is known as the ‘Sacred City’ on account of its many temples and religious buildings. The geographers of antiquity, Strabo and Ptolemy, claimed that Hierapolis was a Phrygian city, because of its proximity to Laodicea on the Lycus and Tripolis, cities situated on the border with the Caria region. Red Water Springs, at the North of Pamukkale in Karahayit Village. Due to having much higher content , the water appear red. The water also much hotter than Pamukkale water. You can enjoy seeing the water comes from the travertines in red color. End of tour transfer to Pamukkale Airport. Flight to Istanbul. After arriving transfer to Hotel.